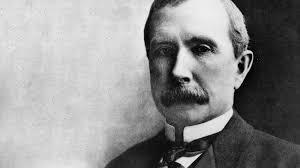 John D Rockefeller starts Standard Oil. By the end of the American Civil War, Cleveland was one of the five main refining centers in the U.S.. By 1869 there was triple the kerosene refining capacity than needed to supply the market, and the capacity remained in excess for many years. On January 10, 1870, Rockefeller abolished the partnership of Rockefeller, Andrews & Flagler, forming Standard Oil of Ohio. Continuing to apply his work ethic and efficiency, Rockefeller quickly expanded the company to be the most profitable refiner in Ohio. Likewise, it became one of the largest shippers of oil and kerosene in the country. The railroads competed fiercely for traffic and, in an attempt to create a cartel to control freight rates, formed the South Improvement Company offering special deals to bulk customers like Standard Oil, outside the main oil centers. The cartel offered preferential treatment as a high-volume shipper, which included not just steep discounts/rebates of up to 50% for their product but rebates for the shipment of competing products. Part of this scheme was the announcement of sharply increased freight charges. This touched off a firestorm of protest from independent oil well owners, including boycotts and vandalism, which led to the discovery of Standard Oil’s part in the deal. A major New York refiner, Charles Pratt and Company, headed by Charles Pratt and Henry H. Rogers, led the opposition to this plan, and railroads soon backed off. Pennsylvania revoked the cartel’s charter, and non-preferential rates were restored for the time being. While competitors may have been unhappy, Rockefeller’s efforts did bring American consumers cheaper kerosene and other oil by-products. Before 1870, oil light was only for the wealthy, provided by expensive whale oil. During the next decade, kerosene became commonly available to the working and middle classes. Undeterred, though vilified for the first time by the press, Rockefeller continued with his self-reinforcing cycle of buying the least efficient competing refiners, improving the efficiency of his operations, pressing for discounts on oil shipments, undercutting his competition, making secret deals, raising investment pools, and buying rivals out. In less than four months in 1872, in what was later known as “The Cleveland Conquest” or “The Cleveland Massacre,” Standard Oil absorbed 22 of its 26 Cleveland competitors. Eventually, even his former antagonists, Pratt and Rogers, saw the futility of continuing to compete against Standard Oil; in 1874, they made a secret agreement with Rockefeller to be acquired. Instead of wanting to eliminate them, Rockefeller saw himself as the industry’s savior, “an angel of mercy” absorbing the weak and making the industry as a whole stronger, more efficient, and more competitive. Standard was growing horizontally and vertically. It added its own pipelines, tank cars, and home delivery network. It kept oil prices low to stave off competitors, made its products affordable to the average household, and, to increase market penetration, sometimes sold below cost. It developed over 300 oil-based products from tar to paint to petroleum jelly to chewing gum. By the end of the 1870s, Standard was refining over 90% of the oil in the U.S. Rockefeller had already become a millionaire. He instinctively realized that orderliness would only proceed from centralized control of large aggregations of plant and capital, with the one aim of an orderly flow of products from the producer to the consumer. That orderly, economic, efficient flow is what we now, many years later, call ‘vertical integration’ I do not know whether Mr. Rockefeller ever used the word ‘integration’. I only know he conceived the idea. In 1877, Standard clashed with Thomas A. Scott, the president of the Pennsylvania Railroad, Standard’s chief hauler. Rockefeller envisioned pipelines as an alternative transport system for oil and began a campaign to build and acquire them. The railroad, seeing Standard’s incursion into the transportation and pipeline fields, struck back and formed a subsidiary to buy and build oil refineries and pipelines. All the fortune that I have made has not served to compensate me for the anxiety of that period. This entry was posted in Uncategorized and tagged 10 January, 1870 by Admin2. Bookmark the permalink.